Rogue Cartoonist: "Alex Jones Plays Megyn Like a Violin"
We’re beginning to see more clashes between the dinosaur media and Internet-based journalists. 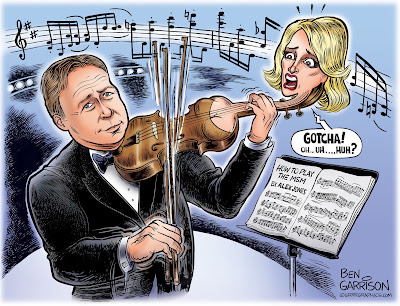 Submitted for your viewing pleasure is a cartoon that sums up the interview Megyn Kelly conducted with Alex Jones. NBC doesn't want to cave in to Alex, so they may be forced to air the interview as a face-saving measure. That will upset their advertisers and give Alex more publicity. If they cancel the segment, NBC and Megyn will be admitting defeat. Either way, it’s a win-win situation for Alex because the mainstream media will be further discredited. I happen to catch Glenn Beck interviewing the big leprechaun, Bill O’Reilly, over the matter. O’Reilly pompously stated Megyn should not given Alex Jones 'a forum.' He also claimed he didn’t know who Alex was and didn’t even know he had a radio show. Yeah. Sure, Bill. What O’Reilly showed me was that the MSM will do or say anything to discredit alternative media. The corporate MSM may have deep pockets, but they're continuing to lose credibility, viewers and readers. It’s good to see them swinging wildly—and missing. A citizen journalist working for little or no money on the Internet often has far more credibility than the overpaid deep state propaganda blowhards on TV.